Home » Articles » 13. Depression? Listen to the Causes! ← 12. Fear, What a Weird Emotion! 13. Depression? Listen to the Causes! You wake up in the morning and know right away what time it is: depression time! You want to turn over and sleep through the day, but you usually have to get up, if only to pee. If you’re lucky, your circumstances will force you to get up and start a structured day, like work, children, letting the dog out. It distracts you, which is good. If you’re unlucky, there is no distraction and another black day awaits you. If you don’t have a daily routine, the depression will get the chance to deepen more quickly. The worst thing is when people say, “It’s all in your head.” They’re really saying, “You’re being childish,” or “You just need to think more positively”. If you are offered medication, chances are high that you will take it because you’re so glad that a solution is being offered. Many people feel better with antidepressants because it is an official recognition that there really is something going on! The recognition is very valuable, and the medication gives you temporary relief. It’s Not in Your Head but in Your Heart! Depression doesn’t disappear by itself; it has an origin! The trick is to listen to it! Not to what is in your head, but to what your heart is whispering! I believe that the origin of depression lies in 3 aspects of our humanity: 1. Our life path, 2. Our memories, and 3. Physical contamination or deficiency. With the MIR-Method we work on all of three causes so that you have a good chance of decreased depression. 1. Being off your life’s path. The most important reason is that you are not following your path. Your life has little fulfillment and each day is pointless. What does it matter? Even if other people think you’ve got it all together, you can experience your life as being shallow. The outside looks good, but you are crying on the inside. You work on this with step 9 of the MIR-Method: “Clarify mission”. 2. Holding on to your past. 3: “Detach father. Detach mother” and with step 7: “Fulfill basic needs”. 3. Contamination and deficiencies in your body. If you have been depressed for more than 2 weeks, start carefully and do only step 5: “Supplement all shortages” and step 7: “Fulfill basic needs”. Do this for 2 weeks and then begin to do all 9 steps. Go to the instruction video and watch, starting at 20.22 minutes. There I explain more about starting with only step 5 and 7. I mentioned a few steps of the MIR-Method above, but it remains important that you always follow all 9 steps. Never leave out any of the steps because they all work in cooperation with each other! One of the commonly heard reactions is that the MIR-Method answers the problem of depression! Slowly, bit-by-bit, you release yourself from your past, cleanse your body, begin to think clearly and your life path reveals itself. You become aware with every decision: “Is this what I really want?” and, as a result, start to live from your heart! It is amazing what happens to people after following the MIR-Method for a minimum of 4 weeks. My wish for you is that you connect with your heart again and that your life is once again full of activity. I’m looking forward to your life path! “You weren’t born for much.” “If you haven’t got something nice to say don’t say anything at all.” These are the kind of family sayings which can hinder you from living life to the fullest. What saying does your family have? Or, other people’s families? Let me know below! P.S. If you appreciated this article, would you please forward it to other people? You’ll find the links to Facebook, Twitter and LinkedIn below. Thank you very much! Thank you for your insight into our hearts. I am privileged to work with my own unconsciousness in this safe and healing way. I began 10 days ago with 5 and 7 as you suggest for chronic illness. The third day I remembered more details of trauma that occurred at age 8 months. It put my whole suffering in perspective and I am on my way to a real life of increased happiness and productivity. Who knew you could start over again at age seventy? Also my dogs love it. I call it their prayers and they respond with an inner quiet that comforts us all. I am so happy for you! In the Netherlands we have quite a lot of 60+ people that do the MIR-Method! Wishing you and your dogs increasing health and happiness! I am so happy for you! Thanks for letting me know! The MIR-Method might be a good addition to my zen meditation and make changes more easily? Yes, sure you can! Enjoy! Thank you for your recognition and very kind words! I am very happy that I set it free. I never imagined so many people would pick it up and benefit from it. It’s just great to witness this all! Hope it brings you much, much good! Ik veronderstel dat deze ook in het nederlands bestaat, Mireille? I have been wondering about the affect of past lives on my health. Could the MIR Method help clear past life trauma? Yes, the method includes past life trauma. The method will wipe out, bit by bit, any memory or emotion that is still bothering you. 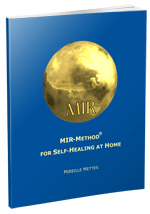 Hi Mireille, I have been using the MIR-Method religiously since early January. While it seems to work well for others, I can’t say I’ve seen any positive changes in myself. I was hoping to feel better emotionally. It’s not a big time commitment but I’m not sure if I should continue. I feel disappointed. Thank you in advance for your comments. Yes, there are more people like you for who it takes more time before the emotions start to let go. Do you do all 9 steps like it is explained in the video? I will write an article about it, because when people use it not long enough, it can cause disappointment. I hope you are willing to continu and if results take too long, just make a one time appointment with one of the MIR-Method guides, so he/she can find out what is still blocking you. I love this method, simple, to the point, no frills and it works. Am glad that I know about it and that I can leave all medical treatments in the pharmacy, thus saving me a lot of money, time and energy. Am so glad to hear that it brings you so much good! I hope you can inspire many others to give it a try too! Thank you for sharing it! If you have any results, could you please write them at the Testimonials page? Thank you!